Every Monday, I feature a different vendor (usually photography-related) on my blog! I’ll share a little bit about the business itself and the products/service it offers. And this is the sweet part…..each of these businesses have shown huge generosity by either giving away a product, offering a discount on their services, or BOTH! ***UPDATE*** – The winner of the Victorian Headband is comment #23 – GRETCHEN KINGSLEY!!! Congratulations, Gretchen, enjoy!! I’m so pleased to introduce you to The Bitsy Beau! Katrina is a stay at home mom to three fabulous children and she loves to create unique and special hair accessories for children and adults. Her Etsy Shop is filled with a variety of clips, headbands, and her newest line of crochet hats! Whether you are looking for a beautiful photo prop, need something for a special occasion such as a birthday or baby shower gift, or just every day wear, you’re sure to find something you’ll LOVE at The Bitsy Beau! 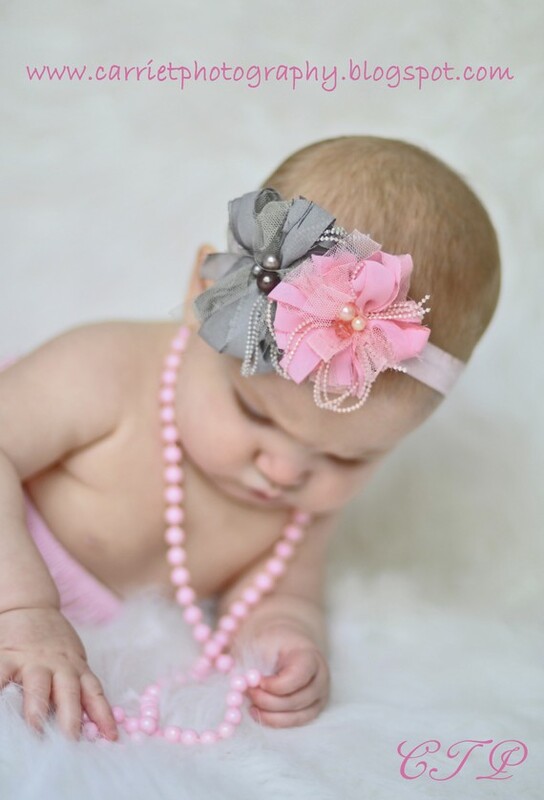 Today, The Bitsy Beau is GIVING AWAY this ***gorgeous*** pink and gray chiffon beaded Victorian Headband to a lucky winner! There are a few ways (3, in fact) – Do any or all of them, and then come back to this blog post and leave a comment for each step you did. 2} Check out The Bitsy Beau on Facebook, or if you are already a fan – great! — Feel free to let her know Jaci Forshtay | Photographer sent you today! **Don’t forget to come back and leave a comment before for each step(s) you did…the winners will be chosen randomly from the blog comments. This promotion is in no way sponsored, endorsed or administered by, or associated with, Facebook. You understand that you are providing your information to Jaci Forshtay Photography and not to Facebook.